After much speculation and several exciting leaks, Tottenham new kits for 2017-18 have been launched. In contrast to last few years, they have been designed by Nike – the new kit sponsor of the club – and constructed using their proprietary technology. Gone are the blue “shoulder pads” of last year in favor of a sleek and classy one colour design, accented only with underarm stripes. The red lettering on home jerseys remains, but the Under Armour logo has been replaced by the new Nike check mark. The Spurs crest on the left breast is now once again encased in a shield in homage to 1961 Tottenham team that was the first one to win the English League and the FA Cup in the same year. The shirt is designed to offer superior mobility, with raglan sleeves and side insets, which allow for natural movement. Made of recycled polyester, it is branded by Nike to feature their proprietary AeroSwift technology as well as Nike Dri-Fit which is supposed to help an athlete stay dry and comfortable by moving the sweat away from the body and to the surface of the microfiber, polyester fabric where it evaporates. The simplicity of the Tottenham new kits design proves the old age saying that less is often better. There is class in purity and the Spurs have definitely tapped into it. The home jersey looks especially impressive. The lines are clean, the design is sleek and the white finish of the home shirt lends itself to wearing with any other apparel. This is definitely a shirt for the players and the fans, as it can look great worn with jeans or under an open jacket on a cooler day. The alternate dark blue away version offers great contrast for those willing to invest in more than one jersey or prefer darker colours. 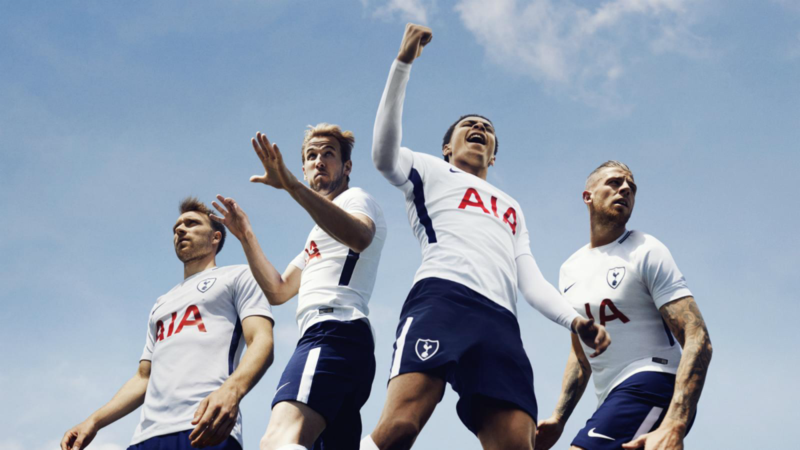 One thing for sure – the new Tottenham 2017-18 kit looks great and given the team’s last year’s form it may just propel the Spurs to new accolades, channeling the spirit of the great 1961 club. As with all new official Nike football apparel, the Tottenham new kits come in two versions, both available to fans. The Vapor Match jerseys are the same shirts that the players wear. They are tight fitting and quite stretchable but also more expensive. For those more budget conscious the Vapor Stadium Jersey offers a cheaper alternative and looks great. It’s looser fitting and lacks the AeroSwift technology but does come with Nike Dri-FIT which will keep one cooler on hot days. The choice is up to you and is probably based on your finances, but those fans whose bodies may not resemble a professional athlete in size anymore will look better in the Stadium shirt, as it is more forgiving and less snug. The promotional video for Tottenham new 2017-18 kit prominently features Eric Dier, Harry Kane, Dele Alli and Hugo Lloris. As all four have been the subject of transfer speculations of late, perhaps the Spurs are sending us a message? Leave a comment below to tell us how YOU rate the Tottenham new kits. A flop or a design masterpiece? Sharp gear and a very engaging review! Not quite enough to win over my torso, but my son is more of a football fan, so I’ll check it out for him – he wears sports gear most of the time. Thanks for the detailed analysis, as he is a very particular guy with exclusive taste, not like his old man. never know these are available to buy. What a unique collection for the real football fans. Great idea to collect them on one website. Easy to choose!